The cover of the Dec. 2-8 edition of the St. Louis Business Journal highlighted Webster's MBA ranking. Webster University again topped the St. Louis Business Journal's annual list for the largest MBA programs in the greater St. Louis area. 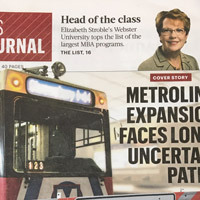 Webster's ranking is highlighted on the cover of the Dec. 2-8 edition with a picture of Webster University President Elizabeth (Beth) J. Stroble. A full listing of the top 10 appears on page 16 of the print edition and can be viewed online here. The ranking is by current MBA enrollment for the 2016-17 academic year. It does not include online students. Webster was also at the top of the 2015-16 list. The Business Journal compiled the rankings through questionnaires to each university with an MBA program in the Missouri counties of St. Louis, St. Charles, Lincoln, Warren, Franklin, Washington, Jefferson and the city of St. Louis, and the Illinois counties of St. Clair, Madison, Jersey, Clinton, Calhoun, Macoupin, Bond and Monroe. Visit Webster's George Herbert Walker School of Business & Technology to learn more about the MBA program, including online, dual-degree and 1-year MBA options.